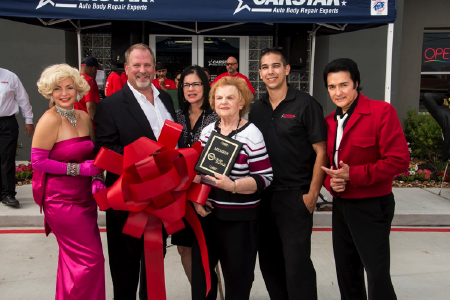 SPRING, TX (November 13, 2015) – CARSTAR store openings are always a big event, but they don’t always come with Elvis Presley and Marilyn Monroe! CARSTAR A1 Auto’s Collision held their grand opening of their brand new facility on Friday, Nov. 6. The new 15,000 sq. ft., 50’s retro style facility, located at 8882 Louetta Rd in Spring, Texas, has been the dream of Don and Jacquie Ward since they started their business in 2005. In attendance were approximately 300 guests consisting of insurance industry personnel, current and previous customers, some dating back to 2005. There was a ribbon cutting by the Spring-Klein Chamber of Commerce, a car show, a food truck, and prize giveaway. Some prizes were given to the customer having had the largest repair as well as the customer with the most visits. Elvis Presley and Marilyn Monroe impersonators were on hand to provide the afternoons live entertainment. The evening was finished up by a cake cutting celebrating the 10th anniversary of the shop’s opening in June 2005. A great time was had by all.